To the memory of the Jewish children of Zakroczym perished in the Holocaust and their names and graves unknown. 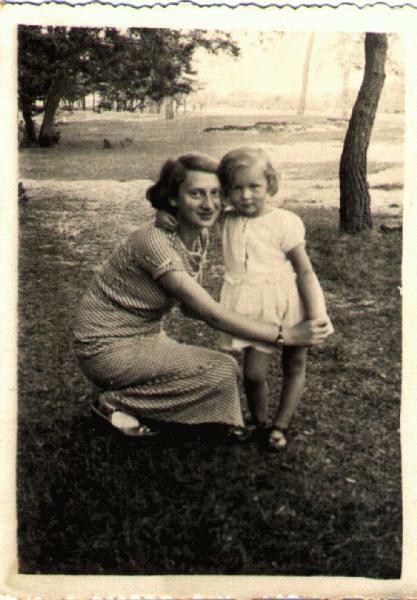 Who is the little girl in the old photograph, seen with my mother Rywcia Gostynska Gombin, 1934? There are more such pictures with the same beautiful little unknown girl, a little niece from Zakroczym. She perished in the Holocaust, without leaving any traces. I want to know and remember her name! I see myself when looking at her picture... The little girl haunts me. What was her sin to be punished with the most cruel death, the German devil invented??? Where was God to protect her??? Translated from the Hebrew - "Pinkas Hakehilot" Encyclopedia of Jewish Communities - Poland: Vol. IV: Warsaw and District, Yad Vashem, 1989, p. 216-218, written by Shmuel Levin and Vila Orbach. Zakroczym is mentioned in documents in the year 1065. Initially it was a village owned by the nobility. In 1387 it received special privileges from Yanosz, Prince of Mazowia. It is not known when and from whom Zakroczym received full municipal status in accordance with the Magdeburg Law - presumably it gained this in 1492. In 1564 it contained 276 houses and several workshops. Zakroczym developed rapidly, and in that same century was one of the most important towns in Mazowia. In 1619 its municipal privileges were reconfirmed by King Sigmund III. Zakroczym suffered badly during the war with the Swedes in the 50s of the 17th century, and did not recover until the end of the 18th. It then came under Prussian rule (with the division of Poland in 1795), and thereafter was included in the Principality of Warsaw (1807) and then in the Kingdom of Congress Poland (1815). In the second half of the 19th century some industrial plants were established there, in particular a factory for forging iron and rolling copper. In 1915 Zakroczym was occupied by the Germans, and at the end of the war was returned to Polish sovereignty. The Jews had always been permitted to settle in Zakroczym without restriction. As early as the 15th century there was a small Jewish community there, but only in the 18th century did the Jewish population actually increase. At that time there were about 100 Jewish families, most of them with their own houses. Many Jews had workshops in various trades (tailors, shoemakers, tinsmiths, etc.). Under Congress Poland the Jews were subjected to restrictions with regard to housing and employment. In 1827 a Jewish quarter was promulgated, but the transfer of Jews to this quarter was postponed from year to year. Until 1862, when the edict was annulled, the matter of the Jewish quarter was a source of much annoyance, and some Jewish families were indeed moved from the forbidden streets to the Jewish dwellings. In spite of these restrictions the number of Jews in Zakroczym increased constantly and the scope of their economic activity was extended. In the second half of the 19th century there were already some industrial plants under Jewish ownership, such as flour mills, weaving mills, breweries and tanneries. The Jews were the principal distributors of local industrial products, as well as purchasers of agricultural produce from the surrounding villages. The livelihood of the Jews of Zakroczym was considerably curtailed at the beginning of the 20th century due to growing competition from Polish merchants and the establishment of a local Polish cooperative. An organized community was established in Zakroczym in the 20s of the 19th century, when a synagogue was built, and a cemetery consecrated, The synagogue, which was of wood, went up in flames in 1852. Some ten years later the foundations were laid for a new synagogue, including rooms for religious study (Talmud Torah). Construction of this synagogue was completed in 1868. It was a fine building and considered one of the largest and most noteworthy in the whole area. From 1840 to 1879 the rabbi was Zvi Hirsch Rawitz. In the 1890s the minister was Yona Mordechai Zlotnik, author of the book "Wings of a Dove" (Kanfei Yona - Yona means 'dove' in Hebrew), and later rabbi of Plock. At the beginning of the 20th century the rabbi of Zakroczym was Efraim Fischl Mordechai Horowitz. In 1899 a Provident Fund was set up, and in 1911 the Hospice for the Poor. The first Zionist group was organized in 1898. Branches of the "Bund" and of "Poalei Zion" were established in the early 20th century. In 1907 the first public library was opened. The occupation of Zakroczym by the Germans in 1915 entailed at first a number of economic limitations for the Jews, such as confiscation of goods; however, in Zakroczym, as in other occupied areas, the period was marked by a resurgence in political and social activity. In 1916 a Zionist Federation was established and attracted many members. At the same time another library was opened, with a reading room that was also used for lectures and performances. In 1917 a drama circle was organized, but this later split off into a group of the "Bund" and a group of the Zionists. In the last stages of the First World War the Jews of Zakroczym also suffered from bombardment by the retreating German forces, and several of their houses were destroyed. There were also instances of brutality towards the Jews by the German soldiers. During this period too the majority of the Jews of Zakroczym were engaged in crafts and small trading. A few found employment in the summer season in nearby holiday areas. Some factories were owned by Jews. The economic situation of the majority was difficult. To enable them to weather the economic depression of the times and to stand up against anti-Semitic activity there was established in 1926 a Provident Fund (Gmilut Chasidim) (in addition to the one existing before the war). The new Fund increased its short-term capital from 900 to 16,000 zlotys - and also enjoyed grants from the "Joint" and from the Community. It gave merchants and craftsmen interest-free loans. 1928 saw the establishment of the Cooperative Bank, and it too helped the needy with credit on easy terms. The Jewish Community continued as usual with social welfare activities, and also looked after the Jewish soldiers serving in the garrison in Zakroczym. The traditional institutions and activities, such as care of the sick, the hostel, and the hospice for the poor also continued. In the early 1930s organizations of merchants and craftsmen were set up, and these two bodies established provident funds of their own to provide members with interest-free loans. Branches of almost all the Jewish parties in Poland were active in Zakroczym. Amongst the Zionists the strongest faction was that of the General Zionists, who usually secured the majority of votes in the elections to the Zionist Congress. Hamizrachi contained the movements Torah veAvoda (Torah and Work) and Hashomer Hadati (The Religious Watchman). There were also branches of Poalei Zion and the Revisionists. The youth movements included Hechalutz (The Pioneer), started in 1926, Hanoar Hazioni (Zionist Youth) and the religious Beitar. Agudat Israel too started activities in Zakroczym in the early 20s, and was a close competitor to the Zionists in efforts to influence the community and its social welfare institutions. The "Bund" in Zakroczym renewed its activities after the war, especially in the sphere of the trade unions, and set up local branches of imovement "Zukunft" (Future) and its children's group "Skif". The illegal Communist Party was also present in Zakroczym, and some of its members were Jews. In 1924 six Jews were accused of belonginthis Party and were sentenced to prison terms of two to five years. The rabbi durinwar period was Yitzchak Serbe. The community ran a Talmud Torah for the sons of the poor. Immediately after the First World War Agudat Israel opened a school for girls - "Bet Yaakov", and the Zionists established their school - "Tarbut" (Culture) and attached to it evening classes in Hebrew, Bible, and Jewish History. However, due to lack of funds, "Tarbut" was closed in 1929. During the 30s anti-Semitic activity increased, especially through boycott of Jewish trade and workshops. In November 1934 there were anti-Jewish riots that continued for some days. Thugs attacked Jews and looted their property. Similar activities took place in 1936: gangs of anti-Semitic youths threw stones at the synagogue and at nearby Jewish houses and smashed their windowpanes. Due to its proximity to the fortifications of Modlin Zakroczym was badly damaged during the battles of September 1939. Many of its inhabitants, including scores of Jews, were killed or wounded; and 70% of its houses were destroyed. In that month most of the Jews fled from Zakroczym, mostly to Warsaw, but also to nearby towns, such as Plonsk. After hostilities some 280-300 Jews returned to Zakroczym, and to them were soon added Jews from elsewhere. In accordance with the new German administrative system Zakroczym was in October 1939 placed in the Plonsk District and included in "Bezirk Czechanów" (Czechanów Area). The town authority was in the hands of the local Germans (Volksdeutsche) and, to begin with, their attitude to their Jewish neighbors was reasonable. However, when the Gestapo, the Gendarmes and the German soldiers arrived in Zakroczym maltreatment of the Jews commenced. On October 12th the Germans assembled all the inhabitants of the town in the market place. From their ranks 50, Jews and Poles, were singled out and transported in the direction of the village of Palmiri, where all trace of them was lost. From the first day of the occupation Jews were sent out to forced labor, whereafter representatives of the Jewish community took upon themselves to supply the Germans and the municipality with the workers they required. Jewish artisans were permitted to ply their trade, especially for the Germans, until the Jewish community ceased to exist. On a Sunday at the end of June or the beginning of July 1941 the town was surrounded by German gendarmes and armed local Germans. The Jews were herded into the market place. Those who did not possess residence permits in Zakroczym, together with the old, were put onto lorries and taken off to the camp at Pomiechówek. For these deportees, who were literally dying of hunger, the Jews of Zakroczym took food and soup to the camp. Israel Gesziw and his wife and Hirsch Katz were prominent in this effort. Poles too were among those who contributed food. In the middle of November 1941 the Germans removed all the Jews of Zakroczym to the ghetto of Nowy Dwór, where they shared the fate of the local Jews. After the war some Jews returned to Zakroczym, but left again and immigrated, mainly to Israel, where in the 1960s there were 50-70 former residents of Zakroczym. In Zakroczym itself there remained no trace of the Jewish community that had once numbered thousands of souls. The synagogue and the cemetery were totally obliterated during the Nazi occupation. Josef Zilberberg: Zakroczym Sheli, My Zakroczym, Published by the Author, Tel Aviv, 1985. Shtetl Co-OP ZAKROCZYM was organized in May 2000, to transcribe and decipher all Indexes of Jewish Vital Records existing for Zakroczym in the 19th century. The indices were generously contributed by Kirsten and Morris Gradel of Denmark. The project is led by Steven Rosenberg and dedicated team who includes Morris Wirth, Kirsten Gradel and Ada Holtzman who transcribe the indices to add to JRI database. The Zakroczym birth, marriage and death records were moved from the Nowy Dwor Archive close to 2 years ago. They are now at the Grodzisk Mazowiecki Archive. Surname List: Zakroczym. All surnames contained in Jewish civil records of the town of Zakroczym in the PSA project. Who is the girl in the old photograph, seen with my uncle, Pinkus Gostynski in the forest of Gombin? Ben Guyer (Chaja) informed me she was his cousin, and her mother was the sister of my grandfather, Jakob Gostynski from Gombin. She married a baker in Zakroczym. The family perished in the Nazi Holocaust. What were their names?